Whenever I’m on a business trip for work I always try to scout out the dining scene of said city and pick a great restaurant. On my most recent trip, my longtime friend Chris used to live in Atlanta and his family is from the area, so his immediate suggestion was Empire State South. 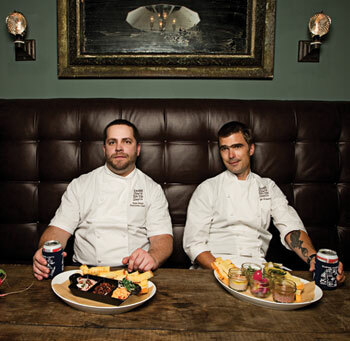 Empire State South (ESS) has been featured in Food and Wine Magazine, to the New York Times and it’s for good reason. 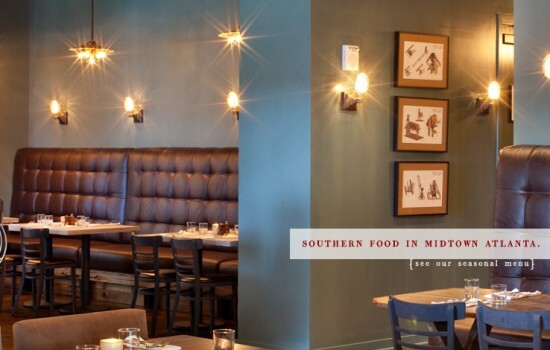 ESS can be described as, “a modern version of the traditional “meat and three” soul food restaurant.” Hugh Acheson is a Partner at ESS while the Executive Chef is Ryan Smith (he just announced he is actually leaving, but he was there while I was. Both of which, I hear nothing but great things from. I travel solo usually and mid-week, so when I arrived in downtown Atlanta off of the main drag, Peachtree Street I cozied up to the bar and began to soak it in. 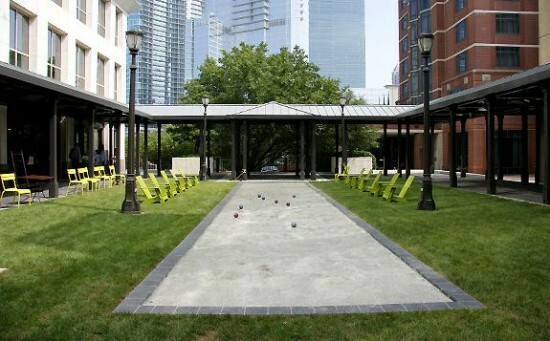 As I entered through the back of their location, there were long wooden picnic tables, a game of bocce ball “court” setup and lounge chairs for those waiting for a table, in the humid Atlanta spring air. It felt like someone’s warm and inviting backyard. People were laughing, there were cans of beer, glasses of whiskey and I was immediately comfortable. The restaurant itself is filled with pine and cypress wood from the floor to the ceilings and there’s a slight feeling of an old classic saloon, but with a modern twist. 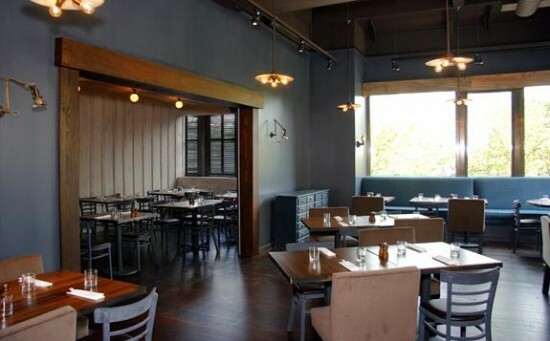 The walls are a mix of gray/blue/green color and some of the booths have great leather upholstery, while you sit at a solid wooden table (see above). At the bar, the staff dressed much like you might see at a speakeasy with vests, Southern inspired gingham and plaid while their spirits section was displayed wonderfully across the entire bar wall (with a sliding ladder to access the top). The restaurant serves breakfast, weekend brunch, lunch, dinner and even a to-go service. They’ve got it all covered. The service, even at the bar, was attentive, thoughtful and kind. I ended up ordering and having, one of my favorite meals of 2013. 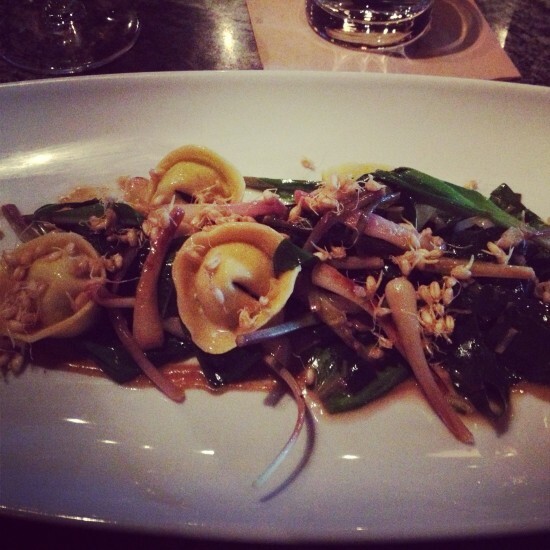 I ordered the Fava Bean Tortellini which came with a fermented raisin puree: swiss chard, green garlic, ramps, sprouted wheatberries. This was an incredibly beautiful dish, that was pungent with the savory ramps and green garlic. My only complaint, for $20 I had about 6 tortellini and would have loved more. I had a Commanderie de peyrassol rosé alongside my meal that was lovely, bright and crisp. Although I didn’t get too nuts with their cocktail program (titled Hooch on the menu) I liked what they had going on, with interesting spirits and they even were rocking my Iowa Templeton Rye. I couldn’t resist going all in and ordering a dessert so I asked the bartender his favorite dessert and without hesitation, he guided me to the Cocoa and Farro Brioche. This bread pudding comes with toffee sauced, puffed farro (I loved the crunch! ), coffee toffee and malted milk ice ream. I licked the bowl. Literally. The evening was lovely overall. I’m so glad I went and to anyone in the Atlanta area, I recommend Empire State South. I don’t think you will be let down. Note: Please excuse the food photos, ala my iPhone. All other photos via Empire State South’s website. Previous post: Edible Spray Paint – Yay or Nay?